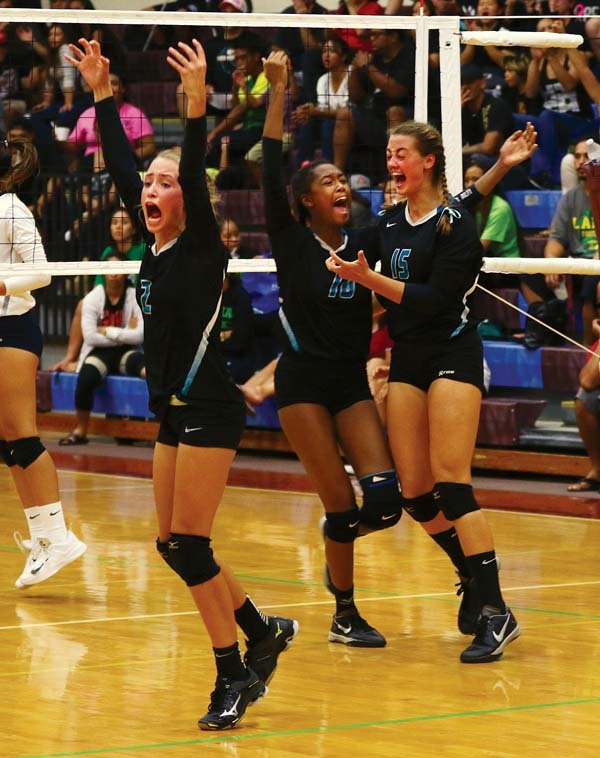 WAILUKU — Things are getting better, in every sense of the word, for the King Kekaulike High School girls volleyball team. 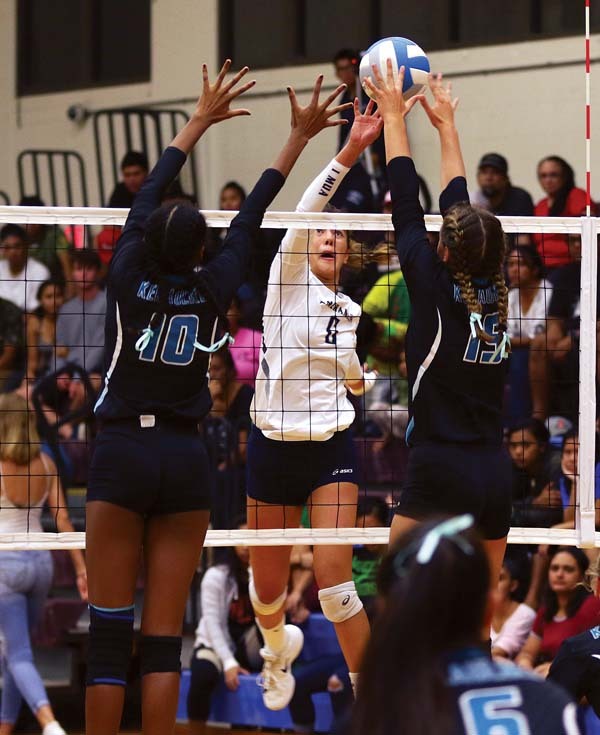 Na Alii got 18 kills from an intense — and healthy — Chandler Cowell on Friday night, and beat previously undefeated Kamehameha Maui 21-25, 25-13, 26-24, 25-14 in the Maui Interscholastic League Division I tournament final at Jon Garcia Gym. The outcome means the teams will meet again today at Baldwin for the MIL’s overall championship — Na Alii (9-5) are seeking their fourth straight league crown, while the Warriors (13-1) are bidding for their first since a run of 10 in a row was halted by King Kekaulike in 2013. Cowell, who also had 18 digs, produced two of the biggest points of the match in the third set. 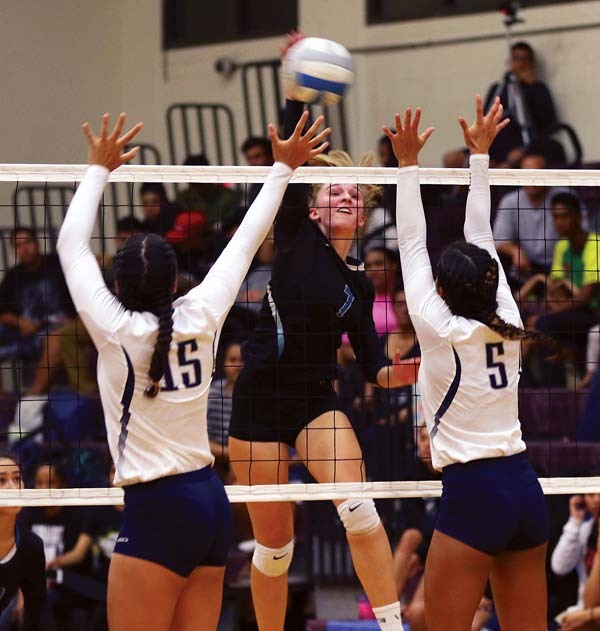 Her tip over the net put King Kekaulike in front 25-24, after which the senior gathered her team for a brief huddle, shouting over the noise from the stands. “I said ‘Girls, no matter how many points are on the board, it’s crunch time. We’ve got to play our game. Let’s go.’ “ Cowell recalled. Her kill that followed ended the set. “Chandler’s a straight-up gamer,” King Kekaulike coach Al Paschoal said. Cowell also had two kills to start a 4-0 run that ended the match. “Our setters (Victoria Martins and Lauren Albrecht) were giving me nectar,” she said. Cowell’s injury was one of many Na Alii have endured this season. Nina Macphetridge played in the MIL semifinals after missing three matches with a concussion. Kalena Vaivai is out with a broken foot, and Shaina Rapanot-Uyechi has a torn knee ligament. Macphetridge had 14 kills and 12 digs Friday, Albrecht had 22 assists and 14 digs and Nanna Inouye had 26 digs. Alea Cervantes and Talia Leauanae each had eight kills for Kamehameha. Leauanae also had 25 digs, and Inez Garcia had 22. Aliah Ayau had 32 assists. “To be honest, I think that we needed to taste a loss,” Warriors coach Alex Akana said.